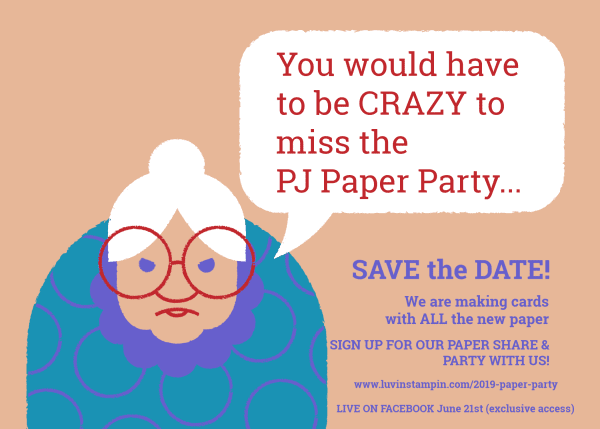 I am over the moon to announce my 2019-2020 Annual Catalog Paper Share! Because this ain’t no ordinary paper share!? Do you get your Stampin’ Up! designer series paper and then it sits? You don’t know where to start or don’t know what to do with it? Well have I got a surprise for you! How would you like a card kit for EVERY SINGLE new paper being released!? Better yet, how would you like a live PJ Party to see how to put all those kits together?!? + There are 4 different options for signing up. Something for everyone. The two stamp sets are included with the $129 option. I’m already signed on as a demonstrator so which option would make sense for me? I signed up and spent a ton of money on products over the last several months, I found you on utube and I just love following you. The $79 option with just the paper and the kits would be good. Because you then get an all access pass to the other stuff along with being entered in the prize drawings. The stamp sets we are using are Butterfly Wishes and I Say Hello so you could buy those yourself on June 3rd if you wanted to so that you get the CSV credit.